Get set & go with this amazingly comfortable and stylish kurti from the house of CrazeVilla. 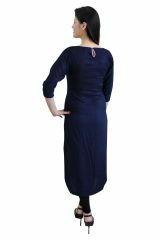 This kurti has navy blue color front, back and sleeves. Front section of the kurti is having single slit at left side.